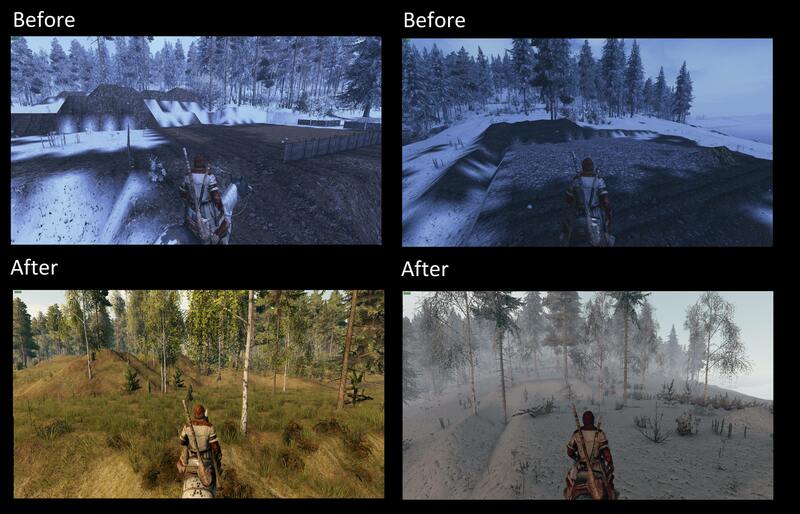 Life is Feudal is a game with great graphics which makes for some amazing and beautiful natural landscapes. However, over time, the land has been torn up by players. The world instead looks rather unnatural. And this is especially obvious for new players. Here are two examples of two landscapes, which have sharp edges, dropped soil, dropped ore and paved stone. These scars in the landscapes are everywhere. Literally covering the worlds. 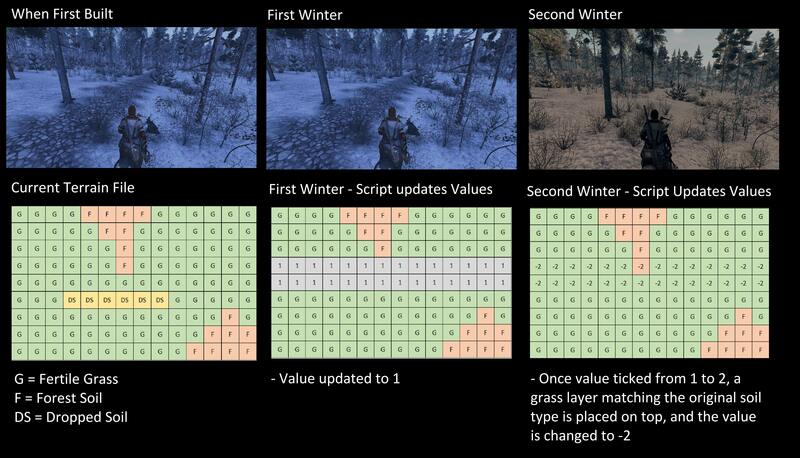 I propose that the developers create a script which cleans up the world every 1/4 of the year or mid winter ingame. This script would ONLY change tile OUTSIDE of claimed land. a) Remove flattened ground (de-flatten) - this will help to make the world look more natural, even in heavily terraformed areas. Yes, players can do this themselves if the want to make their area look nice. BUT i don't think its the responsibility of the current population to repair the scars of 1000s of other players. The worlds are ugly and this is something new players bring up a lot. The next thing that I think the script could do would be to cover Paving/dropped rock/slate/marble and dropped ore with a thin layer of Grass. I.e. Similar to caved in dirt being 1-3 stone per 0.1 dig instead of 30. The above dig up volume is important because of roads. Roads are often outside claimed land and as such would be subject to mother nature. If that road is getting used a lot, you don't want to have to dig it up and get a full inventory every 10-15 tiles. If you make the "grass" only contain 1 Stone of dirt, you could clear 270-600 tiles of a road quickly before having to drop the dirt. I think dropped rock and ore could be "covered" after 1 ingame year but paved areas should only be covered after 2 ingame years. The developers have spent a lot of time and effort make LiF a graphically beautiful game. Mother Nature is essential to keeping LiF looking amazing. Its doesnt need to be high on the priority list but i cant imagine it taken much of a development effort. If you are looking for it, you will still be able to see the past occupation of the land, but it means you will have to get right up close. I don't need to summarise much, ill let the photos do the talking. Like tdpreis, Nate884, lisajayne54 and 2 others likes this post. Awesome idea! I had a similar thouhgt, but gave up after the "road problem". It seems you solved it!